The Nirvana Group of Education runs a Community Education Centre a few streets away from the school. The centre runs after-school classes for kids as well as adult education classes for the local residents – all at minimal fees. We recently started advertising the centre on TV to attract more local residents. After-school tuition classes are taught daily in all major subjects for Nirvana kids and for children from other schools in the area. 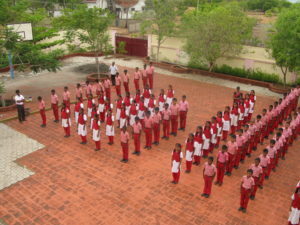 The classes are taught by four teachers from the school. Basic English conversation and grammar are taught to nearby children as well as to adults to help them get work in small organizations. Some students come to learn typing on the typewriter first to familiarise themselves with using a typewriter before moving onto a computer keyboard. An outside teacher, employed by the school, comes in to teach a one-year sewing course to the local women. For the first six months, students learn basic sewing, followed by sewing dresses and full outfits. The tailor makes all the Nirvana school uniforms and employs the sewing students to create them. At the end of the course, each student is given a sewing machine. This course teaches women to create handicrafts such as pen-stands, wall hangings and paper bags which they can sell locally.